The September 22 2012 River Clean Up was my first as the new director. and Kerin and Victor Laurence. Without you the Clean Up would not have been possible. I think we made a difference in the appearance of Glenn Otto Park and river bar, Lewis and Clark Park and Boat Ramp, Dabney Park, and the road along the Sandy River. 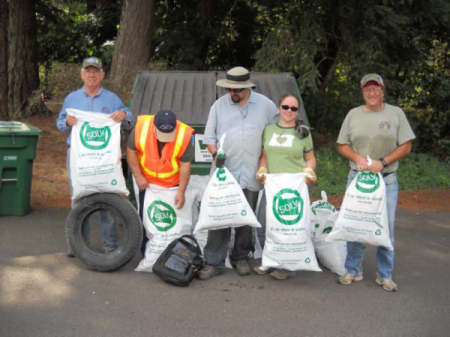 A total of 15 bags of litter was collected including a tire and a backpack. Some of us were ready when the camera came out, but Mike, Howard, and the Colonel had to leave before our group photo Our next river clean up will be in the Spring and I hope we can get more volunteers.